Always worried about your jewelry or accessories? Here's a perfect solution from Store Indya, Wooden Jewelry box to keep your stuff secured and organized. Enough space to keep big as well as small jewelry. Not only keeps your precious belonging in place but will also keep them secure from possible scratches and damages. Crafted in unique designs to make it for your use as well as to complement your classic dressing table. Store Indya comes into existence to bridge the gap between you and the artisans in different corners of India, each having its own creative treasures and uniqueness. We work with an objective of reviving these art forms and empowering the skilled artisans to present their creativity in a whole new range of products never crafted before. The asymmetry present in handmade product makes it truly unique and beautiful. As it is handcrafted, there is a possibility of slight variation in color and/or designs. 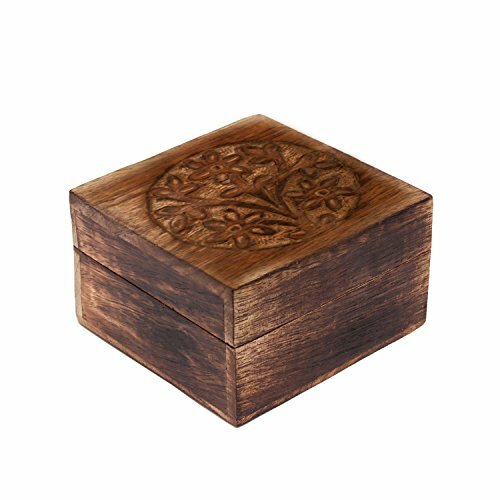 ♥ ANTIQUE AND VINTAGE APPEARANCE: Handcrafted out of mango wood, this keepsake box is durable and water-resistant. The beautiful floral carvings on the top makes this box looks decorative with many utility. ♥ PERFECTLY SIZED: (LxWxH) - 4" x 4" x 3", this multipurpose box is perfectly sized to sit on your dresser without using too much of space. It provides sufficient space to store multiple items in a neat and tidy way. ♥ WIDE APPLICATIONS: Beautiful keepsake jewelry box allows you to store bracelets, necklaces, rings, earrings, watches, cufflinks, brooches, hairpins, ear studs and other jewelry. It can also be used to keep precious stones, pearls, herbs, big tarot cards, Feng shui items, tools and many more. ♥ CLASSY GIFT: Creatively designed wooden jewelry box is ideal for a classic gift. It can be gifted on the occasion of Mother's Day, Father's Day, Housewarming, Birthday, Christmas & New Year. It is one of the most thoughtful gift you can give your loved ones! ♥TRADITIONAL CRAFTMANSHIP 100% SATISFACTION GUARANTEED: By purchasing this product from Store Indya, you will help sustain the 1,000 year traditions of handmade artistry of ethnic artisans living off the heartland of India, as we will donate 10% of our profits to train a new generation of artisans with modern techniques of craftsmanship. ⚡To ensure you receive genuine item, please make sure to buy from "storeindya" as a seller during checkout & avail FREE RETURNS⚡. NO QUESTION ASKED! If you have any questions about this product by storeindya, contact us by completing and submitting the form below. If you are looking for a specif part number, please include it with your message.